The Megalim Solar Project in Israel is now in commercial operation. It's being called Israel's Multi-Billion Dollar Solar Valley. This is the largest renewable energy project in Israel and one of the largest and most complex in the world. 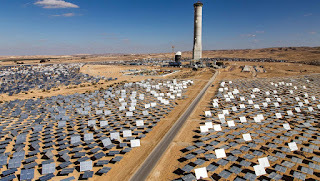 It's a huge, concentrated solar thermal power plant delivering renewable energy in the Negev Desert. 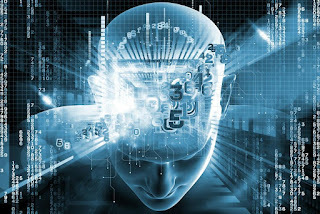 It's provides a daily clean energy supply to Israel's National Grid. It reminds you of Israel's first Prime Minister David Ben-Gurion's promise 60 years ago "to make the desert bloom again". Israel is committed to reaching a goal of 10% of its electricity generation from renewables by 2020. The Megalim is a big part of that goal and it's one of the largest solar plants of its kind in the world. It is a joint venture of BrightSource, GE Renewable Energy and the Noy Fund. 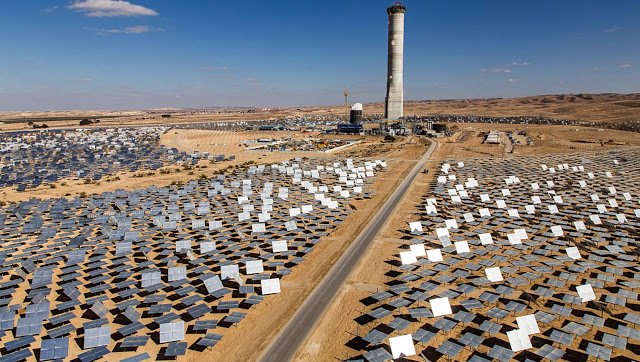 This is a $839 million operation in the Negev Desert that's a leading example of solar thermal power generation. The system uses 50,600 mirrors over a 3 square kilometer site to intensify the power of the solar rays. The thermo solar station in the Negev will provide electricity to 50,000 houses. It's one of three facilities in Ashilim expected to start producing 2% of Israel's electricity capacity. The project includes the world's largest solar tower and will be a 250 megawatt solar power source of electricity.